This issue features stories and pictures from the new ReefNews CD-ROM, "Cayman Brac: Jewel of the West Indies". We hope you'll enjoy these pictures and then order your own copy of this CD-ROM to help support ReefNews. 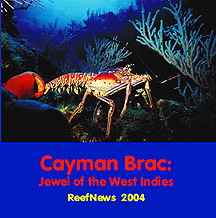 "Cayman Brac: Jewel of the West Indies"
Featuring tropical fishes, corals, sponges, shipwrecks, sunsets, and over 300 pictures and digitial movies, this CD teaches all about this beautiful Caribbean island. Click here to read about and order your copy of this CD-ROM from the ReefNews catalog. 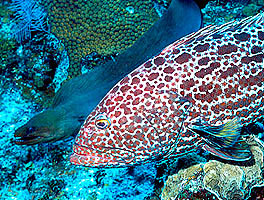 The marine sanctuaries of Cayman Brac protect many rare and endangered species. We were fascinated to watch this huge and uncommon Yellowfin Grouper following a Green Moray Eel as it hunted through the reef in the daytime. Click here to see it up close and read about these two interesting fishes. Speckled Hermit Crabs are beautiful. 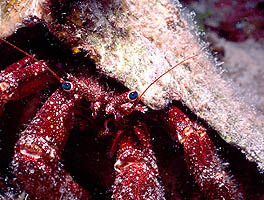 Like other Hermit Crabs, these crabs live in houses that are old shells of big Mollusks. Click here to see this blue-eyed beauty up close. 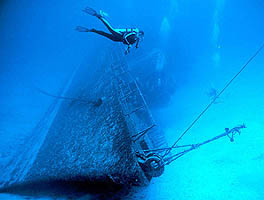 Cayman Brac is home to some amazing shipwrecks. Not really wrecks but actually carefully prepared sunken treasures, these "shipwrecks" are spectacular homes to lots of marine creatures. Click here to explore the wreck of the Soviet Frigate 356. 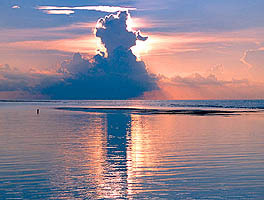 The island of Cayman Brac is filled with all kinds of natural beauty. Click here to see this beautiful 6AM Sunrise!